This guide is about the original release and its ports. For the NES remake, see Ultima IV: Quest of the Avatar (NES). 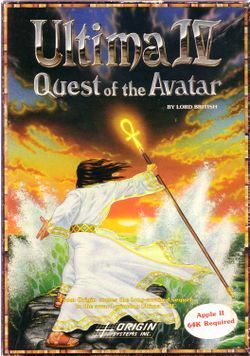 Ultima IV: Quest of the Avatar is the fourth in the series of Ultima computer role-playing games. It is the first in the "Age of Enlightenment" trilogy, shifting the series from the hack and slash, dungeon crawl gameplay of its "Age of Darkness" predecessors towards an ethically-nuanced, story-driven approach. 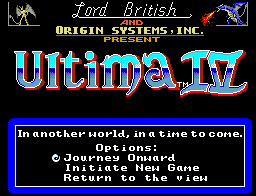 Ultima IV is different among role-playing games in that the game's story does not center on asking a player to overcome a tangible ultimate evil. Note that the most advanced ports are different from the most popular one. 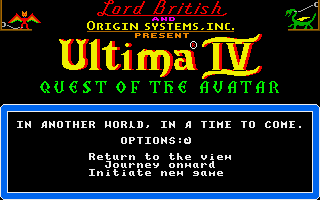 ↑ There is just one difference between these two ports: only the Atari ST allows to transfer a character from Ultima 4 to Ultima 5. This page was last edited on 26 August 2018, at 07:39.